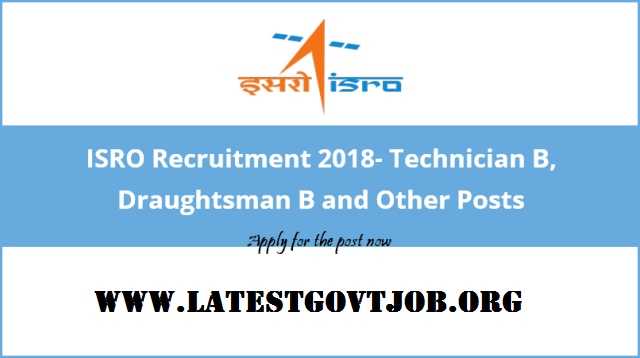 ISRO Recruitment 2018 For Technician B, Technical Assistant & More Posts | www.isro.gov.in : Indian Space Research Organisation (ISRO) has released a notification for the recruitment of 52 Technicians B, Technical Assistants and more. Interested candidates may check the vacancy details and apply online from 21-04-2018 to 11-05-2018. For Technical Assistant: Candidates should have passed First Class Diploma in Mechanical/Electronics/Computer Science/Automobile from a recognised board/institute. All candidates have to pay Rs. 200 through online mode using Net-banking/Credit or Debit Card. Interested and eligible candidates may apply online through ISRO website - http://www.isro.gov.in/ - from 21-04-2018 to 11-05-2018.